"It's good hygiene and manners to wash up before supper." Cooking for Tabby has a lot of advantages. You control what she eats and the quality of ingredients in her food. However, there's a lot to learn about a cat's nutritional needs. Supplements help meet her very specific nutritional needs, including minerals, vitamins and fatty acid requirements. The first thing to understand about supplements is they are not optional; they are required. Though the word "supplement" may give the impression that it's a nice little extra, it's not a choice of if you'll give her supplements, but what supplements Tabby needs. The second thing to know is that the specific supplement and the amount you give her will depend on the recipe you're mixing for Tabby. The ingredients you put in her food will determine what else she'll need to help meet her dietary demands. Dr. Richard Pitcairn, veterinarian and teacher of veterinary homeopathic medicine, recommends a ratio of one part calcium to one part phosphorus in a cat's diet, although that isn't a hard, fast rule. Generally, meat will provide sufficient phosphorus but not calcium, so you'll have to use a supplement. There's a variety of options for meeting Tabby's calcium requirements, including bone meal powder, seaweed, di-calcium phosphate, calcium tablets and eggshell powder; the amount you need will depend on the supplement and the recipe. If you choose bone meal powder for Tabby's supper, make sure it isn't for gardening; she needs bone meal suitable for animals or humans. Calcium tablets should be free of added phosphorus and magnesium. Cats need an adequate amount of fat in their diet. Fats and oils provide Tabby energy and help her build and maintain tissue. Fatty acids, which are smaller components of fats, are particularly important to cats. Cats who are deficient in essential fatty acids, such acid as linoleic acid, can suffer from hair loss, wounds that won't heal and kidney and liver degeneration. Oils such as safflower, sunflower, corn, fish, canola and flax can be good sources for essential fatty acids. As with minerals, the amount of oil you need to add will vary according to the recipe and the oil you choose. Cats are sensitive to the amount of vitamin A they receive, which can present in Tabby's food in cod liver oil, vitamin A and D capsules, liquid vitamin A and D and pet vitamins. Sufficient vitamin A is important in maintaining her good vision and muscle development. Wheat germ oil or capsules can provide vitamin E supplementation, which is a helpful antioxidant. Vitamin B Complex provides her necessary B vitamins to ensure a host of benefits, such as proper nervous and immune system function. A healthy nine pound cat requires 63 micrograms of vitamin A and 2.5 milligrams of vitamin E daily. Your chosen recipes will indicate the appropriate amount of vitamin supplementation, based on what the ingredients provide. Taurine is a component of protein necessary for Tabby's good health. Unlike most other animals, cats don't make their own taurine, so they have to eat foods that provide it for them. Taurine is present in animal-based protein, meaning it's in the meat you use to prepare Tabby's supper. Whether you need to add taurine powder to Tabby's food depends on the recipe you're using. For example, beef hearts are high in taurine, so the amount needed in Tabby's mix would be less than necessary for ground chicken breast. Psyllium husk powder may also be necessary to contribute extra fiber to her diet without adding carbohydrates. 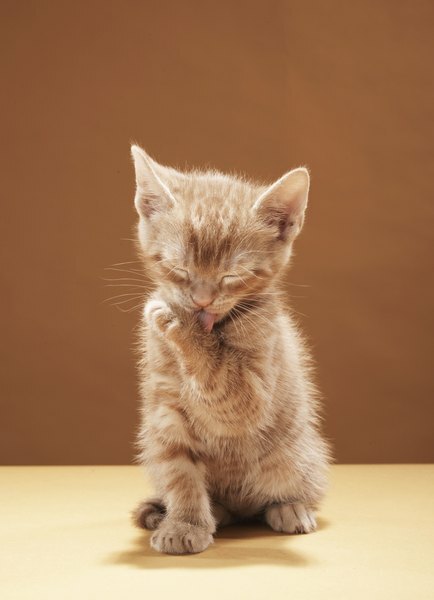 It's especially helpful to cats who may have constipation issues from their new -- or old -- diet.